Experience world-class wildlife viewing in the Canadian Arctic from the comfort of a unique wilderness lodge. Travel to Somerset Island in Nunavut, 500 miles (805 km) north of the Arctic Circle and build your days as you choose with the help of expert guides. Kayaking, ATV excursions, river rafting, and hiking – there are options for everyone. Photograph rare Arctic wildlife, such as elusive musk ox, polar bears, and beluga whales. While exploring, enjoy superb food and exceptional hospitality. There is no better way to experience the Canadian Arctic! When you think of the Arctic, a solid mass of ice may come to mind. Real Arctic scenery is diverse and stunning. Explore this vast landscape on your choice of tour. Choose from options like rafting, hiking or kayaking – or try them all! Witness beluga whales as they play just metres from the shore, as one of the largest beluga whale pods in the world makes its migration past Somerset Island each year. If you’re lucky you may even have the chance to kayak amongst these gentle creatures. Photography enthusiasts will be buzzing from the amazing opportunities to photograph Arctic wildlife. From Arctic Fox, to herds of Muskox, beluga whales, and polar bears, it’s near impossible to put the camera down. A wildlife photography lecture from resident expert helps to hone your skills. Your adventure begins in the northern city of Yellowknife, the capital of Canada’s Northwest Territories. Arrive in the far north city of Yellowknife - a community on the edge of the wilderness. A transfer will take you to your accommodations for the night. Stay overnight at the Explorer Hotel in Yellowknife. Enjoy the famous lobby polar bear exhibit, as well as sweeping views of forests and lakes. Enjoy the hotel's restaurant and lounge, with the wilderness at your doorstep. Board a privately chartered plane for the 4.5 hour journey to the Arctic Wilderness Lodge. On a chartered flight from Yellowknife, you’ll pass over the treeline as you cross the Arctic Circle. Enjoy the aerial views of the Arctic, before landing on Somerset Island. The short journey to the lodge involves a small walk across the tundra and a raft ride across the Cunningham River – the adventure has already begun. Settle in to the lodge and meet your hosts for a safety briefing and overview of the exciting days ahead. Read on for some suggested activities at the Arctic Watch Lodge. Each day you will choose from different activities options, which may vary according to weather conditions and wildlife sightings. While at the lodge, enjoy a choice of activities each day based on what the weather will allow. Jump right into things after breakfast with a hands-on introduction to ATVs, followed by a short hike to check out belugas just a few yards offshore in the estuary. Head back to the lodge for a delicious buffet lunch, then head back out again on a hike to the Triple Waterfalls to see famous nesting birds like peregrine falcons. Along the way, take a moment to notice the tiny beauty of Arctic flowers, and watch for grazing Muskox in the canyon. Wrap up the excitement of your first full day with a hearty dinner. Travel along the Muskox Ridge Trail by ATV, which provides a scenic overview of the entire area. Hop on an ATV and travel the Muskox Ridge Trail through a stunning Arctic panorama, watching for Muskox, arctic foxes and their pups. Stop at Inukshuk Lake for a picnic lunch followed by some catch-and-release fishing for arctic char. Return to the lodge via a different trail to view hoodoo rock formations and local coal deposits. Tonight after dinner you'll have the option to attend an informal lecture by Richard Weber on his North Pole expeditions. Try kayaking in Cunningham Inlet, then embark on a short hike for stunning views of the Northwest Passage and the opportunity to see polar bears. 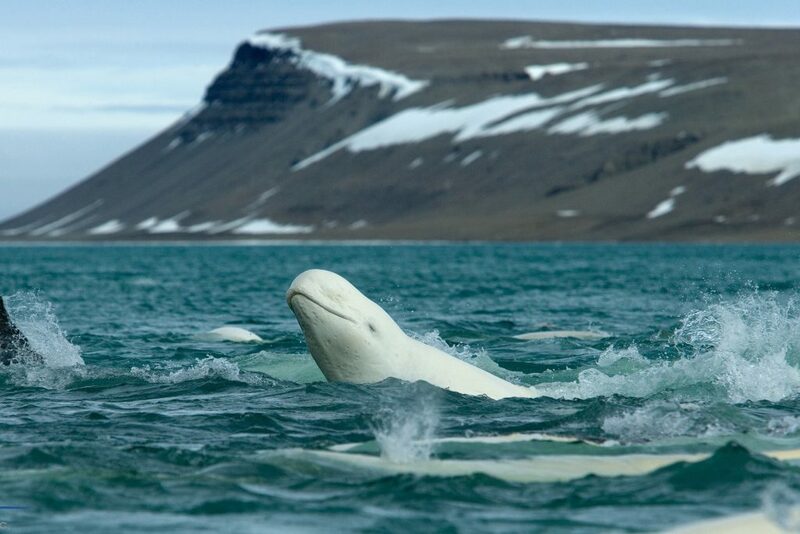 The best time to see beluga whales is in July when they are migrating through the area. Start your day amongst belugas, seals, and pack ice as you sea kayak or paddle board in the Cunningham Inlet. Have lunch on the shoreline then take a short hike to Kayak Falls, a small canyon with stunning views of the Northwest Passage. Spend the afternoon at the estuary, world-famous for its spectacular population of beluga whales and the face that they're only a few metres from shore! After dinner back at the lodge, an informal lecture is offered by Nansen Weber on wildlife photography. Depart for a trip to Flatrock Falls, where you’ll have the option of hiking or traveling by Mercedes Unimog, a multipurpose truck. Head to Flatrock Falls and Somerset Island's unnamed canyons, either by Unimog truck or hiking. Here, immense vertical walls have been pushed out of the earth's crust, and countless fossils litter the ground. After lunch, see with your own eyes the contrast between a barren canyon and a lush gull rookery as you observe the nesting sites of terns, plovers and snow geese. Tonight's after-dinner presentation option is about the history of the Northwest Passage.